Hello, I’m glad you’re here. The best thing you can do for yourself to be organized this holiday season and well everyday is to plan your weekly meal plans. It’s never too late to give it a try! I did some baking this weekend and once again it was a complete gong show. Seriously this always happens to me, thank goodness now I pretty much expect it and can just laugh it off. Trust me that wasn’t always the case. 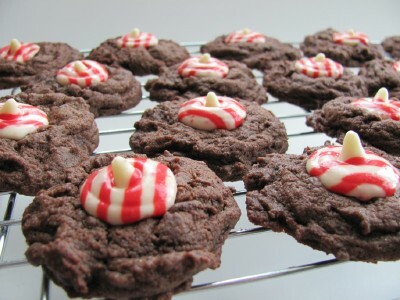 The first recipe I tried were the Chocolate Cookies with Christmas Kisses. I did really well until I came to the end when I followed the instructions to remove the cookies to the wire racks after cooling on the pan for one minute. All was going well until I then added the kiss to the top of each cookie and pressed them in. Do you know what happens to soft cookies on a wire rack when they are pressed in? Yep you guessed it, they fall through, what a mess!! Needless to say my second batch turned out much better. Lesson learned. Next up I tried to make some cake pops using a combination of this recipe and this recipe. I needed a special treat for the teachers at my kid’s school. Okay let me tell you something that most likely won’t be too popular but I have to say it (and yes I realize these are all the rage right now), cake pops are dumb. Am I the only living person who doesn’t like the taste of them? Not to mention that they are time consuming to make AND you have to have very specific ingredients. In other words don’t try these with chocolate chips as they melt too thick and you end up with a big fat huge mess, blah. You need to use candy melting chocolate as it is much thinner for dipping. Lesson learned. Only in this town I couldn’t find any melting chocolate (thank goodness I later found some in my pantry from BC!) NOR could I find a red velvet cake mix (do we even have this in Canada?) and had to sub in cherry instead. Anyway I did what I could and they turned out okay. My family thought they tasted great, so what do I know. I prettied them up a bit to try to disguise my lumps and make them more festive. What do you think? Anyone else have any baking mishaps to share with me to make me feel better? My parents are coming this week to stay with us for Christmas. We are excited to show them our new house and town as they have not been here before. Woohoo! We have pizza every Friday night. Checking out your recipe after I post this comment. Thanks for hosting this! Wow! I can’t believe the power of networking! 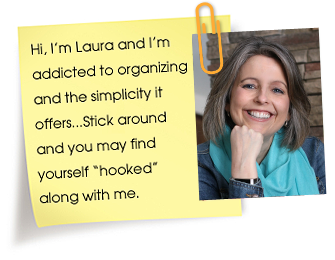 I love the simple recipes you use in your menu plan! What I love even more is these look like recipes my kids will actually eat! Your cake pops look great, although I have to be honest…when I saw them being made on The Today Show, my stomach got upset just thinking about all of the frosting in them and how sweet they must be (I don’t like a lot of sugar or frosting). I love all your baking. I was going to attempt cake pops this year too. I was thinking about snowmen, but now maybe not. I actually love the taste of cake balls- I thought they were similar to cake pops, maybe not? LOL, yes you’re probably right..hahahaha. 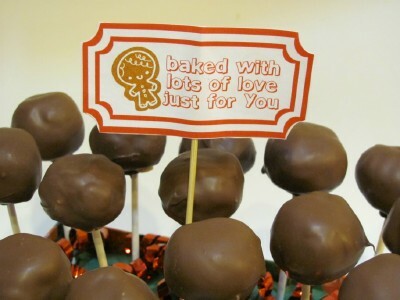 Oh and cake pops are just cake balls on a stick. I’m looking forward to trying the fococcia bread, as well as the garlic chicken! And… I’m with you — not a big fan of cake pops. The cookies look yummy! I have decided that instead of making even more sugary treats for the teachers and friends this year, I am making savory treats like spiced nuts, homemade chex mix, and the most amazing ranch pretzels. Your candy and cookies look great! I cannot make pretty food at all. It tastes good, but mine are not pretty. I think your cake pops look great. At least the rest of your family enjoyed them. 🙂 I keep seeing everyone trying them, and have even seen some gluten free versions, but I have yet to make them. Have a great week! Okay you have no idea how much better you made me feel…I mean you are the baking queen after all! I think part of my problem was I made them too big. They probably would have been easier to work with had they been smaller. You are too sweet! Thanks so much! I think when I made them, I didn’t let them freeze long enough. I’m always in a hurry with everything. They do take some time. Yes, unfortunately, baking does not always happen like we want them to. I had to make 2 batches of my Peanut Butter Cup-Cakes this weekend before they were eatable/blog worthy 🙂 But I love that you said those pops were time consuming, I was considering making those, but now I may re-think that! Those cookies look so yummy! I have to agree with you on the cake balls/pops though. How some people get them all nice and smooth is beyond me. Living in Canada myself, I do have to say that I’ve never seen Red Velvet cake mix either. As for the melting chocolate, they have some at the Bulk Barn or Michael’s. I like they way all your baking looked and I’m sure they tasted great! Who doesn’t love a home-made gift?? Congrats and enjoy all the compliments you get on them! I think my family would be perfectly happy with your menu plan this week. I think I will copy it as much as I can! Love, love, love my bread machine. Especially for dough. If you try the Focaccia bread, would love to know what you think of it. Those cookies look real yummy, a great idea just in time for baking day tomorrow. Yes the cookies were pretty easy to make up and I like that they look Christmasy. Enjoy! The cookies are great very festive. Thanks for sharing your recipe and hosting us today. You have a wonderful week. Thanks so much Miz Helen, you too! Of course Dellene! Welcome back!! LOL…labels are an awesome gift idea!! And 50 DOZEN are you kidding me? I would have died…. Maybe those are the ones I need to take to teachers. Hmmm. 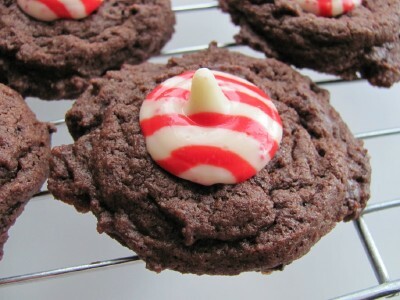 Those chocolate cookies with red and white kisses on top would not last 5 minutes in my house! We’ve gotta try those! And the 40 clove garlic chichen is on my meal plan this week too! We are totally a garlic family. Yum! I must be living in the dark ages as I’ve never heard of “Cake Pops” – they sound silly but I’m sure kids love them… Yours looked great! Baking mishaps are big in our house too… My son once dumped an entire bottle of vanilla into a batch of muffins… Turned out to be the best muffins we ever made… The 1/2 box of baking soda made for REALLY puffy biscuits. Cooking with toddlers means not turning your back for 1/2 a second! Everything looks great – thanks for hosting! Your cookie creations look really good. I like to make cookies for Christmas presents b/c we have so many people in our family. I will def be adding the hersey kiss cookie to the list. I like the looks of your bread recipe also. My husband really likes my home-made pizza so I’m going to give this a try. I grow herbs and I’m always looking for ways to use them. This seems like a good bet for rosemary. Mine were really clumpy as well, I really had to work them and yes so very sweet. I am so glad to hear that I am not the only one who does not like cake balls. It was the baking disaster of 2010 and they all ended up in the trash. I used the chocolate chips too and it was too thick. So nice to know I’m not alone!!! So agree, I definitely don’t think I’ll make them again but I really did want to see what all the fuss was about. Not worth it. Yours do look great, though, I’m sure the teachers will be touched that you spent the time! Oh I hope so, my husband really liked them so that’s a good sign. I think I’m like you and just don’t like the taste of the mixes and canned frosting. Not my thing, I’m more of a salt girl! The cake pops are too darn cute! What a fun little gift! My daughter makes cake balls, which I am guessing are similar to cake pops. Hers are awesome, and she does use a base cake mix, but has experiemented with all kinds of flavors, from orange creamsicle to creme’ brulee! One thing for sure, you can only eat one! Very rich! Love the peppermint kisses, but haven’t been able to find them here in Ottawa – where did you get them??? I just got them at Walmart when they were on sale for three something. They have all the different flavors. The pizza grilled cheese looks so good! I think I will be making that for a weekend lunch. Ha! 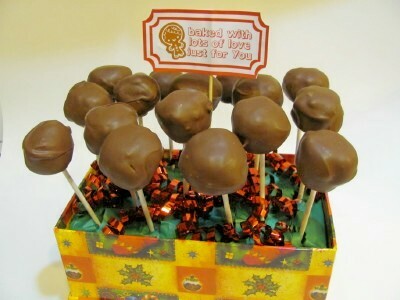 I love cake balls, and the in-laws have been known to fight over the last one, but I think putting them on a stick and decorating them within an inch of your life is waste of time. The rate at which they get inhaled, what’s the point in making them look good? More than half of our Christmas baking has been done by the husband because my work schedule has been insane, and…um…not that I don’t appreciate the help, but…one of the recipes I am going to redo myself if there’s time. It’s supposed to make 72 cute little chocolate-peppermint pinwheels–there’s even a photo–and although what he produced tastes fantastic, there are only 20 of them. They’re…um…they’re not “cute,” let’s say that. That being said, all the rest look and taste great! At 20 batches down, we’re about halfway through the list. The cake pops are hard to make and I am with you on the flavor too! I’ve made cake balls & thought they were fun since it is just cake mix, frosting, & melting chocolate and there are lots of fun to mix & match flavors. I used cherry chip cake mix for mine. They are a pain to roll & dip though and quite time consuming. Not all were round & smoth but I put them in the mini cupcake papers to disguise imperfections! One little trick that I like when using chocolate chips for dipping things is to add some vegetable oil to thin out the chocolate. It works really great! I just finished my big baking day. I make trays of cookies for my family to take to their jobs, schools… Every year I get the urge to dip things in chocolate and EVERY year, without fail, I remember how much I hate doing it! I made cake balls, too. Not a huge fan, but they turned out ok. Yours look great! I think the candies look great! I am waaaay into baking and have recently gotten myself into 3-D/Fondant cake making craze. I’ve had baking mishaps that I would really like to forget, but many of them turn out great. The cake-pop thing is sooo big right now, but what some of me and my friends do to make it easier is skip the lollipop stick and make cake balls…we place them on confectionery papers or cupcake cups. The presentation isn’t as nice, but it’s a little less stressful. Love the labels! Another tip – when I have leftover cake from a shaped cake or something, I use the cake pieces to make cake balls for a little something extra. I’m completely enamored with the idea of cake pops, and have made them a few times; however, they are quite difficult and require practice. If you do not like the flavor of red velvet cake, or cannot find it, any other cake will work. Also, I used the Wilton candy melts, and thinned it down with a few teaspoons of oil. Love reading your blog, especially Menu Planning Mondays. I am so glad I tripped onto your site. I needed a cookie recipe for tomorrow and yours are beautiful. Going to try them. Also love the menu planning links. Thanks so much! Got here too early Monday morning to link up and never made it back. Ahh the holidays. Baking disasters–When I first tried almond flour, I burned a whole batch of tart shells waiting for them to brown. Almond flour goes from perfect to charred in a hurry if you get distracted. Gluten-free baking uses expensive ingredients and I almost cried. You and I could probably write a book on the gong show aspect of our baking (mis)trials. Remind me to tell you sometime about the Maple Apple Cake I tried. Looked and tasted good but boy oh boy the process to get there.